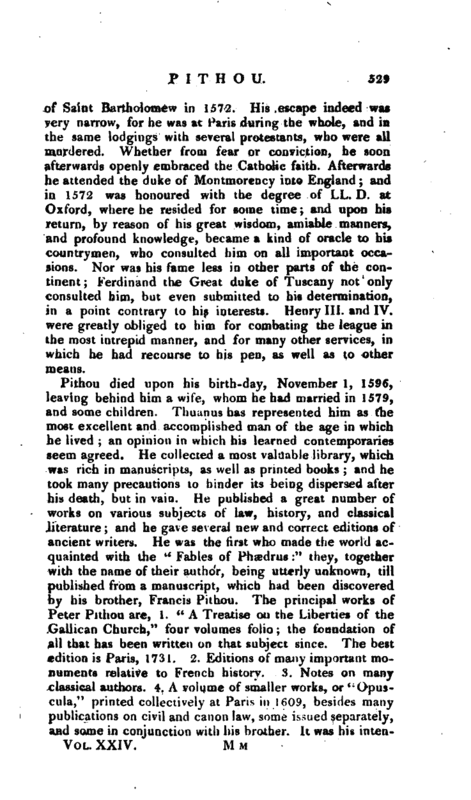 , or Pithceus, a French gentleman of eminence in the republic of letters, was descended from an ancient and noble family in Normandy, and born at Troy es Nov. 1, 1539. 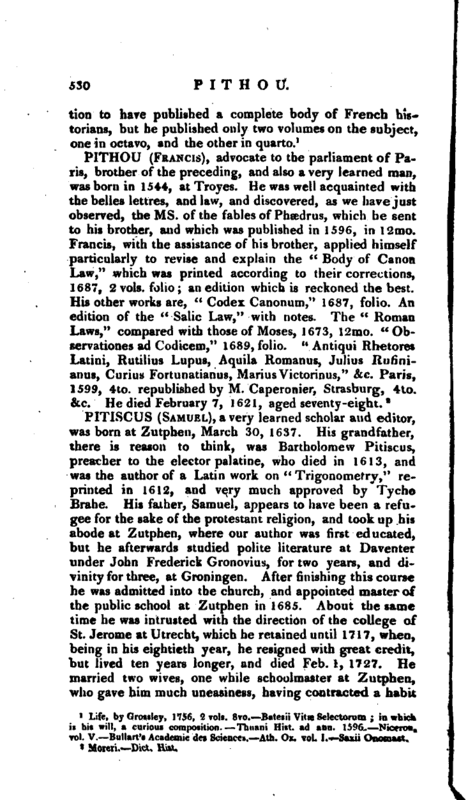 His taste for literature discovered itself early, and it was cultivated to the utmost by the care of his father. He entered upon his studies at Troyes, and was afterwards sent to Paris, where he became tirst the scholar, and then the friend, of Turnebus. When he had finished his pursuits in languages and the belles letters, he was removed to Bourges, and placed under Cujacius, in order to study the civil law. 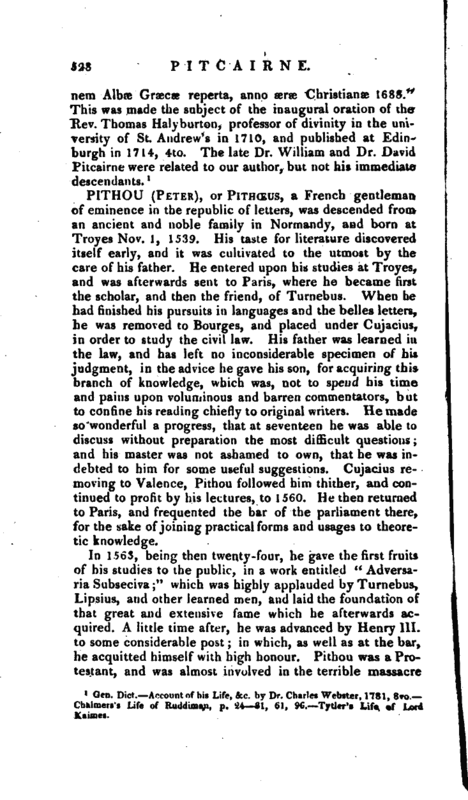 His father was learned in the law, and has left no inconsiderable specimen of his judgment, in the advice he gave his son, for acquiring this branch of knowledge, which was, not to spend his time and pains upon voluminous and barren commentators, but to confine his reading chiefly to original writers. He made so wonderful a progress, that at seventeen he was able to discuss without preparation the most difficult questions; and his master was not ashamed to own, that he was indebted to him for some useful suggestions. Cujacius removing to Valence, Pithou followed him thither, and continued to profit by his lectures, to 1560. He then returned to Paris, and frequented the bar of the parliament there, for the sake of joining practical forms and usages to theoretic knowledge. In 1563, being then twenty-four, he gave the first fruits of his studies to the public, in a work entitled “Adversaria Snbseciva;” which was highly applauded by Turnebus, Lipsius, and other learned men, and laid the foundation of that great and extensive fame which he afterwards acquired. A little time after, he was advanced by Henry III. to some considerable post; in which, as well as at the bar, he acquitted himself with high honour. Pithou was a Protestant, and was almost involved in the terrible massacre | of Saint Bartholomew in 1572. His escape indeed was very narrow, for he was at Paris during the whole, and in the same lodgings with several protestants, who were all murdered. Whether from fear or conviction, he soon afterwards openly embraced the Catholic faith. Afterwards he attended the duke of Montmoiency into England; and in 1572 was honoured with the degree of LL. D. at Oxford, where he resided for some time; and upon his return, by reason of his great wisdom, amiable manners, and profound knowledge, became a kind of oracle to his countrymen, who consulted him on all important occasions. Nor was his fame less in other parts of the continent; Ferdinand the Great duke of Tuscany not only consulted him, but even submitted to his determination, in a point contrary to his interests. Henry III. and IV. were greatly obliged to him for combating the league in the most intrepid manner, and for many other services, in which he had recourse to his pen, as well as to other means. Life, byGrossley, 1756, 2 vols. 8ro. Batesii Vitac Selectornm in which is his will, a curious composition. Thuani Hist, ad ann. K r >96. —Niceron, To!. V. Bullart’s Academic des Sciences. —Ath. Ox. vol. 1. —Saxii Onomast.